How to install and activate this application? 1, Double click the file "DefenseWall_HIPS_v2_56_gizmo_edition.exe" to start the installation. This application is 30 days trial version. 2. You will need to reboot your computer after installation. 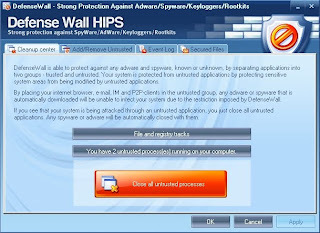 After rebooting you will see a "DefenseWall" window, Click the "Enter code" button and navigate to the license file "TechSupportAlert Giveaway.12.10.2009.dwu" which you downloaded in the zip. Select this file and the installation is complete. That is all you have to do. It supports Windows 2000, XP, 2003 and Vista 32-bit, and Windows 7 32 bit.